During the past decade Geoffrey Paul Boers has emerged as one of this region’s leading choral conductors and teachers. His choirs have performed at national and regional conventions of choral conductors and music educators, earning high praise for their expressiveness and technical mastery. 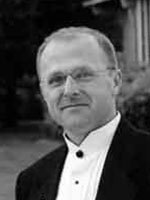 Boers is in constant demand as a conductor, clinician, and workshop leader, both nationally and internationally. Recent conducting engagements have included the west-coast premier of terry Riley’s Sun Rings with the Kronos Quartet, Fanshawe’s African Sanctus at the Sydney Opera House, and Poulenc’s Gloria and an All-Mozart concert at Carnegie Hall. In addition, he has conducted numerous All-State choirs, as well as honor choirs across the United States and Canada; as well as in London; Bangkok, and the Banff Centre for the Performing Arts. This season he will conduct concerts and workshops in Thailand and lead an extensive teaching/conducting tour of mainland China. Boers is in his seventh year as choral director at the University of Washington in Seattle, where he conducts the UW Chamber Singers, a choir of graduate and advanced singers, and the University Chorale, the department’s premier undergraduate vocal ensemble. He also teaches choral literature, conducting, and choral techniques as a part of the graduate choral curriculum. This past summer, the Chamber Singers performed the west coast premier of Terry Riley’s Sun Rings with the renowned Kronos Quartet. This season they performed for the National Association of Schools of Music national convention and will record a CD entitled Libera Nos, Salva Nos: Songs of Liberation. In 2005, they will perform for the national convention for the American Musicological Society and return to the Baltic region for a concert tour. In addition to his position at the UW, Boers is the conductor of the Tacoma Symphony Chorus and will conduct the Tacoma Symphony in two performances this season as well as performances of Nutcracker with the Tacoma Symphony and Ballet. He also sings professionally as a tenor and as a countertenor, and has been a featured soloist with many groups around the United States.